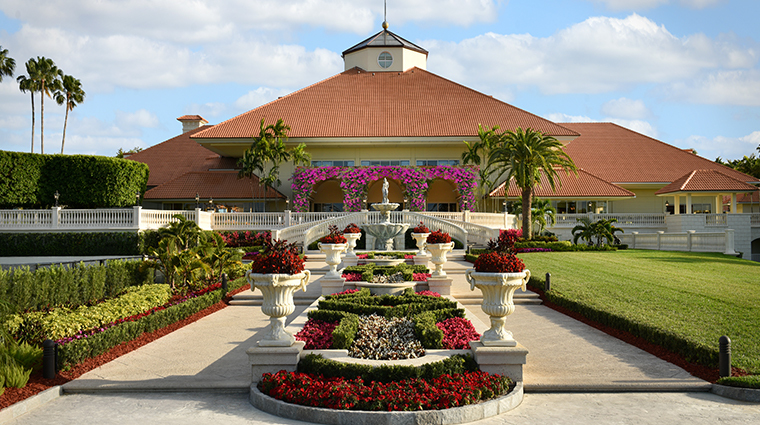 Welcome to a tranquil oasis at The Trump Spa at Trump National Doral, an ideal retreat if you’re seeking the ultimate in relaxation. Awaken your senses with elevated spa experiences from an impressive selection of body and face services available daily for men, women, couples and juniors. Unwind in private lounges, a Jacuzzi, steam room, sauna and adults-only pools. Get pampered at the hair and nail salon or the exclusive Hommage Gentleman’s Atelier. 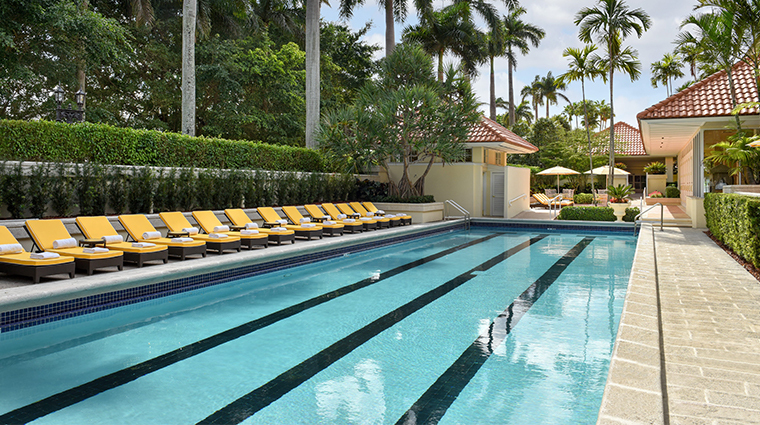 And do it all while luxuriating in the heart of the City of Doral. 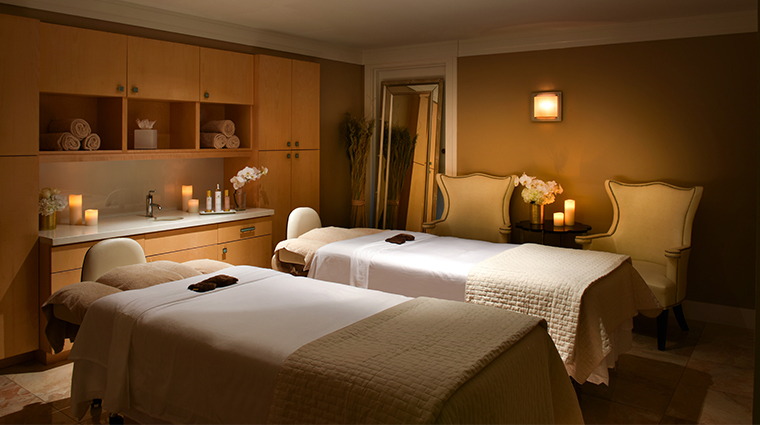 • Personalization is the hallmark of the Miami spa. The spa itself has been enhanced and reconceived to focus on personal luxury and treatments specifically tailored to meet your individual desires and needs. • A boutique-hotel-within-a-hotel, the 48 new Spa Suites represent the most luxurious accommodations on property. The suites come in a soothing palette of ocean blue and cream accented with touches of gold leaf and sparkling Schonbek chandeliers. • Spa Suites feature custom Stark carpeting, breccia-marble-clad bathrooms complete with soaking tubs and massive windows with breathtaking views of the legendary golf courses or lush tropical gardens. 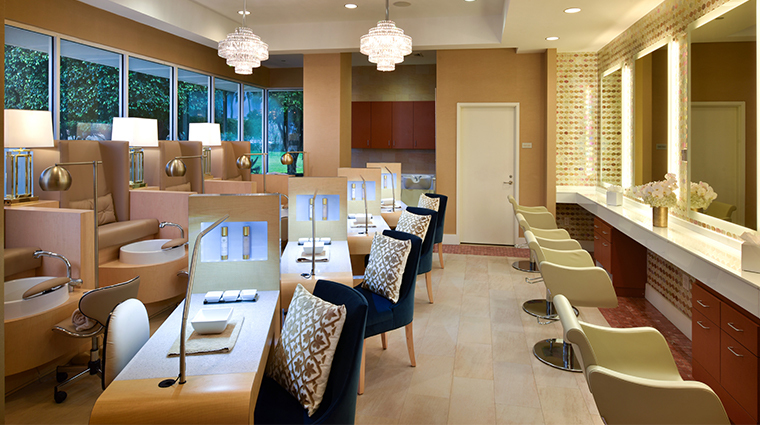 • A new spa salon — outfitted with “pedicure thrones,” manicure and makeup stations and shampoo stations with shiatsu massage chairs — uses Natura Bissé and Oribe products in its services. • For the gentlemen, there’s a Grooming Room offering hot shaves, facials and haircuts using Hommage products, as well as panoramic golf-course views, a 50-inch television and cocktail menu. • Upon arrival, you’ll be asked whether you wish to relax, rejuvenate or detox. From there, attentive expert staff will select the kinds of products and methods to use during treatments. • Ranging in size from 572 square feet for the Spa Executive Studio to 1,736 square feet for the Spa Grand Two-Bedroom Suite, the accommodations provide an array of plush comforts, including Italian bed linens by Bellino, 55-inch flat-screen televisions and signature citrus-mango bath amenities. • A unique mini-bar in the Spa Suites focuses on healthier items, while a special cocktail cart menu provides a variety of decadent delights that are delivered to your room. • As a Spa Suite guest, you’ll have the option to book exclusive in-room treatments, including the Luxury Custom Massage, which includes Swedish techniques and aromatherapy. • The new menu features 30-, 60- and 90-minute services that use top-of-the-line products such as Natura Bissé Barclona, SkinCeuticals, Pure Fiji and Hommage. • Spa menu standouts that are sure to please include the Trump Luxury Massage, Bamboo Body Perfection, Vaidyas Shirodhara Journey, Trump Custom Cleansing Facial and Maternal Caress Body Treatment. • A Spa Jr. menu provides a variety of kid- and teen-friendly treatments, including salon services. 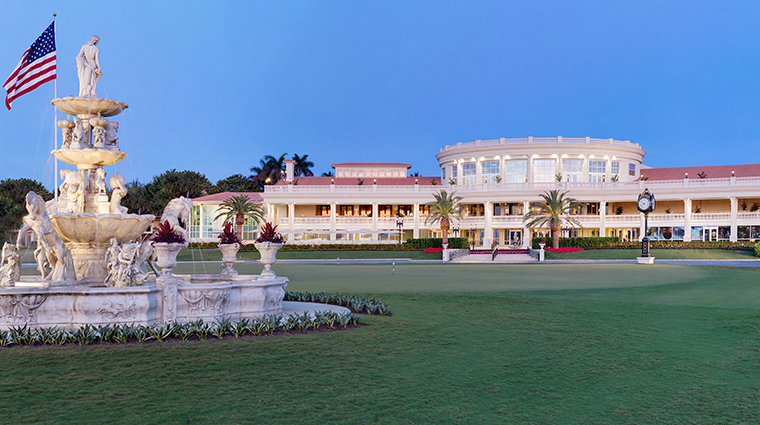 • The Trump Spa also offers a lap pool and butler-staffed locker and dressing rooms. • Arrive with ample time to soak in the serenity of the spa’s amenities including hot and cold plunge pools, Jacuzzi, sauna and steam rooms. • A 24-hour fitness center complete with group fitness classes provides a luxurious way to keep up with your workout regimen.